Although I know the BNP has a web site, and have visited it more than once, I was nonetheless shocked to be told it is the political web site with the most traffic. As Leadbeater provided no reference for the statement, I decided to have a look for myself. Whilst the sites that provide traffic information are notoriously unreliable, both Alexa and Compete provide the same picture. The BNP’s traffic seems to be larger than the UK’s major political parties, as well as some of the smaller ones who may have found it equally difficult to express the opinions in traditional news sources (e.g., greenparty.org.uk, ukip.org, respectcoalition.org, and the extremely un-mainstream natural-law-party.org.uk). Personally I hope that the majority of visitors to the BNP site are approaching them as an antiquated curiosity whose policies shock and disgust, rather than as a site with which they relate. Maybe these statistics give credence to the opinion that has been expressed elsewhere, that whilst the mainstream media state that they abhor the policies of the BNP they do give the small party far more exposure than they really should. Who is going to deliver the news tomorrow? One of the many web topics that is of interest to me is the delivery and sharing of news on the web. Despite the rhetoric of the blogosphere I have never been persuaded that traditional journalism can be successfully replaced by so-called citizen journalism, for the most part the blogosphere highlights, and puts their own opinions on, news stories coming from traditional sources. Whilst I have always cast a cynical eye on the traditional media, I must admit that I didn’t quite realise how far journalism had gone in the cutting of corners and trimming of budgets. 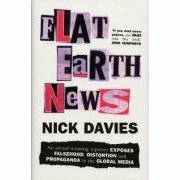 After finishing Nick Davies’ “Flat Earth News“, you can only conclude that news is up the proverbial creek. Even the great BBC, which brought my attention to the book in the first place, is not immune to criticism. Can correspondents really do their job properly as they constantly jump between tv stations, radio, and the web? At a time when the market is clearly not up to the job, surely it is time we should be emphasising the Beeb’s public service credentials rather than trying to force it into playing by the market rules. Surely there should be a campaign out there to increase the licence fee. Yesterday big day for SNS, but what about tomorrow? Whilst we have been waiting for the MySpace story for months, the second was heralded with much less fanfare. Together the two stories mark final growing-up of SNS. The big three have now all been bought (at least in part) and all have developer platforms. They are no longer new and exciting, but rather an integrated part of the web users’ daily lives. Whilst there may be new entrants and new exciting innovations, the heady days are past us. The question now is what is going to be the next big innovation? What will be the next exciting range of products that get the big players fighting over the start-ups? The obvious answer is the virtual worlds of Second Life etc, but they have yet to really capture people’s interest in the same way…and if EA-land is anything to go by they won’t for a while yet. If I knew the next big idea I wouldn’t be writing some crumby blog, instead I would be programming like crazy. But if you know where I should be investing my spare sixpence please feel free to let me know. Nb. In truth I wouldn’t be programming, instead I would be getting others to program for me. Too much wrapping up of programming and web innovation stifles innovation. GigaOm published some interesting data yesterday on worldwide corporate wi-fi usage. Whilst it unsurprisingly highlighted London as the city with the greatest number of corporate wi-fi users in the world (after all it is the world’s greatest city), I was personally surprised at the low proportion of users accessing wi-fi in cafes. Whilst I appreciate that business users have a lot of time on their hands in hotels and airports, I would expect this to be overwhelmed by the numerous 5/10 mins here and there in cafes all the time. Even in the back-of-beyond that is Wolverhampton I have found half a dozen cafes where I can get free wi-fi, from which I average 3-4hrs access week (sometimes a lot more). It would seem as though theiPass results can only tell the story of how their users use their service, rather than reflecting the growth of wi-fi use generally. That is the data I would really like to see. nb. I would also like to see an increase in links on posts to their sources. The lack of links seems to be increasingly popular over the last few months. When it comes to boring jobs I like to think I have had some of the worst: taking the shells off of hard boiled eggs, taking the green bits off of tomatoes, and, most recently, classifying web links. Yes, I can classify the links at home with a constant supply of coffee and the music of my choice, but it is still one of the most boring jobs. The reason: web pages come in ever imaginable form, mostly with no discernible purpose, with links placed just because the web owner can. Classifying the web is like herding ADHD cats. The good and interesting sites that we visit every day are surrounded by a web of crap that we only usually trip across if we are unlucky. These are not necessarily offensive sites, just sites that are absolute rubbish: spam, half-formed, badly written, orphaned. Classifying the web means that we have to wallow in this web of crap. Its not like classifying a library of books, but rather like classifying a whole world of which 90% is the council rubbish tip. The Google share price is now the lowest it has been since October 2006, with some analysts predicting that it has another 20% to go! In the same way no-one knew how quickly the price would rise, no-one has a clue about how far it would fall. Even my own, rather negative, opinion now seems extremely optimistic.Today is likely to see the price fall below $400, and all this before the impact of a Microsoft buyout of Yahoo and a downturn in the US economy has yet to hit. Whilst I find it hard to believe the price will fall much lower than $300 nothing would shock me now, I am just pleased that Google is losing a bit of its shine and look forward to their having a rocky ride in the future. Not all links are equal! Thanks to a single link on the BBC’s delicious roll on Saturday night, yesterday saw Webometric Thoughts get its highest number of hits ever. Whilst for many sites 121 absolute unique visitors in a day (according to Google analytics) wouldn’t be worthy of note, the webometric blogging community have fairly low aspirations. What is interesting, from the perspective of a Google Analytics junkie, is the difference between the amount of traffic this link drove in comparison to a similar on the BBC’s delicious roll on the 16th January. Whilst the January link only drove 17 unique users to my site, Saturday’s link drove 102 users over a three day period! Was the extra traffic all due to the extra time the link was visible on the BBC? It was visible a lot longer, but weekend traffic is often slower. Or was it the topic of the posts? The first was about ISPs, whilst the second was about the iPhone. It seems equally likely that the difference in the traffic is due to the link’s anchor text. Whereas the first text referred to ‘David Stuart research fellow’, the second link merely referenced the blog ‘Webometric Thoughts’ (AC seems to have done much more digging than NR). Not all links are equal, however equal they may seem. iPlayer on the iPhone: Does the BBC believe the hype? I am probably the world’s biggest BBC fan, and think they have made some great moves on the internet, especially with the rolling out of the iPlayer. But now they have managed to annoy me. Just catching up on my RSS feeds, and found that yesterday the iPlayer became accessible on the iPhone. Whilst I look forward to the BBC rolling out on mobile devices, choosing the iPhone first is just annoying. I appreciate that they have to roll the services out across the different systems one at a time, but I don’t understand why they chose the iPhone over the S60 based devices, specifically the N95 which would have made the service available to many more times the customers. It is not a repeat of the Linux/Apple/Windows debate as Windows was always the dominant platform. The iPhone is only the dominant device in the minds of certain sections of the blogosphere. “We started with iPhone because it is the device most optimised for high quality video currently available”…seems a pretty lame excuse to me, especially as the N95 would have allowed for true mobile viewing as it could utilise 3G rather than being limited to Wi-Fi. Obviously part of my annoyance is due to my having an N95, but in my defense I haven’t moaned about the lack of access on the Wii or the fact that when I try to access BBC files on the Netgear EVA 700 it refuses to give me a picture (unlike the Channel 4 programmes which work perfectly). I think this time it’s a legitimate whinge. Tapping into the Google Adsense Millions! In the early days of my blog I decided to not bother with adverts; after all, it seemed highly unlikely that I would generate enough traffic to earn the Google Adsense minimum. However, as I have been blogging I have found that the visitor numbers have steadily increased, and if they continue in the right direction I have hopes of eventually getting the blog to pay for itself! My hosting package is costing me £56.37 for two years. According to the article I read when I made my original decision, a rough rule of thumb is that 1,000 impressions will make 50 cents. February saw my webometrics blog gain 2,160 impressions…so that would equate to just over a dollar. Whilst the numbers probably aren’t quite there yet, it’s worth a try if the numbers keep improving. Admittedly I hope the standard of the ads improves. The first ads are for www.postersonwheels.co.uk and www.bee-moved.co.uk. If anyone visiting my site clicked on one of those I would be extremely suprised. Nb. I still think the ads look tacky, but I have tried to place mine in a fairly unobtrusive place. Facebook Harassment: When is a poke one too many? As I sat in my dentist’s waiting room yesterday (no work necessary, thanks for asking), I read a report in the Daily Telegraph about the first man who has been taken to court in the UK for allegedly harassing his ex-girlfriend via Facebook. Whilst all new communication technologies seem to eventually make it to court for allegedly involving harassment, surely after the first unwanted sheep or two had been thrown in the ex-girlfriend’s direction, or he had poked her once too often, she would have simply de-friended him. As the trial is only up the road I am almost tempted to go along later in the month and find out exactly the role Facebook took, surely it was a minor part that the media have decided to focus on.